The other day I was reminded of a disturbing TV ad from about a year ago. The ad was for a 'natural' cosmetic series. It was simply put together – a continuous list of chemical names rolled across the screen, similar to how movie credits are usually presented. Each name had the word 'no' in front of it. As the names rolled by, a soothing female voice explained how healthy and chemical free this new, all-natural product series was, and that all of the dangerous chemicals you were seeing on the screen were nowhere to be found in this wonderful series. The voice further explained how your family could now feel perfectly safe and chemical free. At last – security and peace of mind were available in the 'all natural' contents of these products. They ALL sound dangerous, don't they? After all, they're chemicals! Every one of the chemicals in the above list come from all-natural essential oils. They have a variety of functions: such as to help heal, calm, desinfect, deodorize, battle infection, soothe, preserve, stimulate cell regeneration and do all kinds of other good and health-inducing things. Of course, if you overdose and misuse them, they can become irritants and toxins. But then, so can C-vitamin, green tea, and bananas – even plain old water can be dangerous to your system if you overdo it. I honestly don't remember the name of the product series that was being advertised, because at the time (and even now) I could only focus on the distasteful function the ad had – to sell products by feeding existing fears and spreading misinformation. Somewhere along the line during the forward march of organic and natural products (which – make no mistake – I applaud enthusiastically), the word chemical became a baddie – the Big No No. Chemicals have become synonymous with danger – a reason for alarm and worry. Even worse are the 'chemically educated' – people that actually work with these life-threatening substances on a daily basis. Surely they must all be plotting together to create some horrid fate for the rest of us. This, unfortunately, is a viewpoint I meet far too often. Somewhere along the line, while focusing on prioritizing the natural and organic, we have become a society of chemophobes. I am (unfortunately) a sinner here too. I have used the 'chemical-free' phrase to describe my own products. But it really isn't a fair description. In fact, it is petro-chemicals I choose to exclude. Life (and product development) would actually be a heck of a lot easier for me if I would let up on my plant-based principles and let a few non-plant-based emulsifiers into my life and products. Because the plain and simple truth is petrochemical ingredients function well and most don't even come close to being health hazardous. Many are even harmless to the environment. 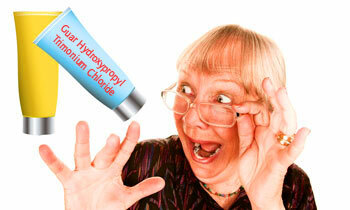 PPS: The ingredient that is giving grandma the fright of her life in the picture above is guar gum. Can't every substance known to man be identified through a chemical name? I mean, everything, whether naturally occurring or man made, is made up og molecules and their connections. This may be silly, but aren't 'chemicals' just the scientific name for things? !